Venezuela said it beefed up its troop presence along the border with Colombia as its neighbor's incoming finance minister vowed on Monday to restore trade between the feuding Andean nations. Venezuelan President Hugo Chavez broke off diplomatic ties with Colombia last week, bringing the countries' troubled relations to a new low after Bogota alleged that his government allowed leftist Colombian rebels to operate bases there. Chavez, a leftist former soldier whose popularity has been slipping ahead of legislative elections next month, called the charges a "hoax" and an excuse for Colombia to launch a U.S.-backed invasion he says would start a "100-year war." The United States on Monday said it had no intention of taking military action against Venezuela. Venezuela met with United Nations' Secretary General Ban Ki-Moon to explain its position. About 1,000 National Guard soldiers arrived in the border region over the weekend and were reinforcing posts along the 1,375-mile (2,200-km) long frontier, said Franklin Marquez, a regional commander for the National Guard. "We have a reinforcement of 980 to 1,000 troops for the protection of the border, but there are no unusual operations; we are staying on alert," Marquez said. The border region has remained calm and most analysts believe a military clash is unlikely between the nations, which have often squabbled over border security and guerrillas. But border skirmishes are possible in a volatile region plagued by clashing ideologies and drug trafficking. The United States urged Chavez, an outspoken standard-bearer for socialism and anti-U.S. sentiment in Latin America, to address Colombia's charges that 1,500 Colombian rebels are camped out in Venezuela. "We have no intention of engaging a military action against Venezuela," U.S. State Department spokesman Phillip Crowley told reporters on Monday. "Rather than posturing, it would be much more constructive for Venezuela to engage directly, answer these questions." 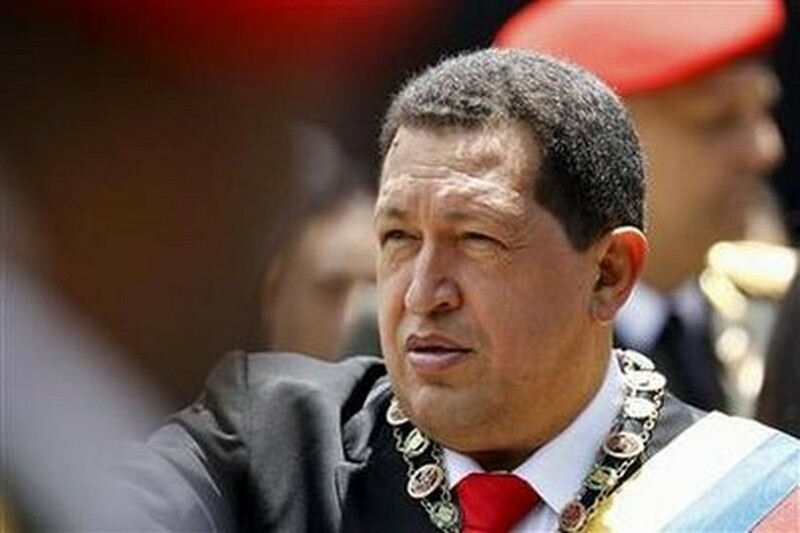 Chavez responded on Sunday by threatening to cut off Venezuela's oil supplies to the United States if Colombia attacks. But analysts say that would be a devastating blow for Venezuela's economy, which is already shrinking and suffering from 30 percent annual inflation. Bilateral trade with Colombia, once at $7 billion annually, has plummeted since Chavez ordered a freeze on trade last year to protest a deal allowing U.S. forces to use Colombian bases. Jose Rozo, the president of a business group in the border state of Tachira, said cross-border trade in several frontier towns had plunged by about 60 percent in the past three days. "A rise in troops levels on the border isn't justified; it is only hurting the residents here," said Cesar Perez Vivas, the opposition governor of Tachira. "We have reports that 20,000 jobs have been lost because of this breaking of ties with Colombia." Outgoing Colombian President Alvaro Uribe triggered the latest spat with his long-time leftist foe Chavez when he accused him of allowing outlawed Colombian guerrillas to operate bases inside Venezuelan territory. Colombia presented photos, videos and maps to the Organization of American States to back its charges. President-elect Juan Manuel Santos will take over from Uribe on August 7 and is expected to work to salvage trade and diplomatic ties, although he shares the current president's conservative views and suspicion of Chavez. Uribe, at Santos' request, replaced Colombia's military chief Fredy Padilla with Admiral Edgar Celis on Monday. Padilla was widely expected to retire at the transition of governments next month. The change was not expected to usher in military policies much different from those of Uribe, who is popular for his U.S.-backed crackdown on leftist insurgents. Like Santos, Padilla has an outstanding arrest order issued against him by an Ecuadorean court for the 2008 bombing of a Colombian rebel camp on Ecuador's side of the border. Brazilian President Luiz Inacio Lula da Silva and other regional leaders are due to visit Caracas prior to Santos' inauguration, which Chavez will not attend. Venezuela's ambassador to the U.N., Jorge Valero, said he had rejected an offer from Ban to help resolve the feud. "We said that those lamentable realities had to be treated bilaterally," Valero said, adding he hoped Santos would not lend himself to the warmongering plans of Uribe and the United States. Santos has been muted about the latest rift with Caracas, but his incoming finance minister said on Monday that one of the new government's top priorities would be re-establishing trade. Juan Carlos Echeverry said the priority would be "re-establishing a major part of commerce in the shortest possible time." Colombia's office of the presidency said in a statement on Monday that the government was studying ways to help affected areas, including reducing requirements for free-trade zones and alleviating taxes. Colombia's trade ministry said Bogota was studying ways to help affected areas, including making requirements for investing in free trade zones in four frontier states more flexible, and temporarily reducing the IVA tax. Colombia's central bank estimates that exports to Venezuela will fall to $1.2 billion this year from $4 billion in 2009 and more than $6 billion in 2008.